Includes: back zipper purple jumpsuit with printed yellow bat symbol and stirrup leggings, reversible purple/yellow cape with batwing fringe, yellow utility belt, purple gloves and matching bat ear headpiece/mask with attached hair. Brave girls do not fear and always stand against crime like our favorite super girl Batgirl. Feel confident and daring in batgirl costume. 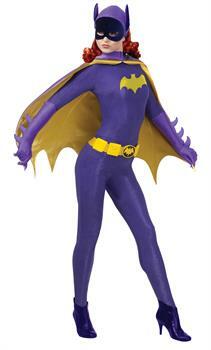 Get your favorite super girl look in an amazing batgirl outfit with style and power. Women's love to explore many costumes ideas before deciding for her party costume. Women always look for colorful and innovative party dress. You might explore more costumes but you will definitely fall in love with our Batman Classic 1966 Series Grand Heritage Batgirl Adult costume. Material: Polyester. Exclusive of Trim. Care Instruction: Hand Wash in Cold Water. Line Dry. Do Not Bleach.